Juanita is an award winning beading artist. Her passion for beading started about 25 years ago. She designs and beads various types of items including tapestries, sculptures, and jewelry. She has been published four times including the “Spring 2011 Showcase” by Beadcreator and the “My work” section of Bead and Button Magazine. She has published her own book titled “Beaded Inspirations”. It is a picture book designed to inspire. She recently closed her art gallery, which was exclusively for beaded art, to pursue teaching and creating bead-weaving art. 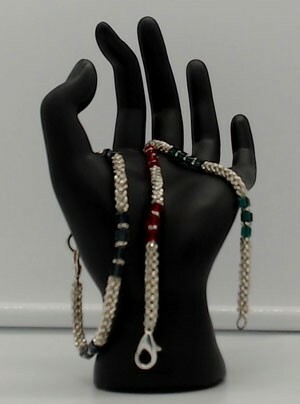 She has taught bead-weaving in various locations around the country including Chicago, Il., Roswell, NM, and Artesia, NM,. She believes that bead work is an art form and tries to push the boundaries in herself and her students.She recently closed her art gallery, which was exclusively for beaded art, to pursue teaching and creating bead-weaving art. The elegence of this bracelet hides the complexity of it. This class will teach turbular Right Angle Weave, and Cubic Right Angle Weave. This is a 3 hour class and project might not be completed in class.